Energy supply and demand is a huge concern as the national population grows. Technology advancements in smart grids and renewable energy are offering a variety of solutions to energy consumption at scale. A vital piece to energy use is the grid operation center. These centers are stationed all over our nation and manage the flow of energy between the grid and the consumer. Grid operators are responsible for preventing power blackouts, “sloshing,” and energy failures at the grid. The grid operator’s successful management of energy from hour to hour make our energy consumption possible. If you’re ready to take the next step toward saving money on utility bills, reducing carbon emissions, and creating a better future for your loved ones, give us a call today to discuss installing a solar energy system on your home or business. Otherwise, continue reading to learn more about smart grids and operation centers. What are grid operation centers? A grid operation center simply manages the flow of power from the grid to the consumer. You’ve probably noticed the towers, power lines, and various other electrical components that make up our energy transfer systems. This system is what supplies power to buildings, appliances, electronics, and more. The traditional systems have operation centers, where grid operators ensure the amount of energy being requested is being used. If at any point the energy requested is not being used, the operators can make an adjustment to not waste power. Also, grid operation centers manage the path energy takes from the grid to the consumer. The power that keeps your lights on, powers your computer, or runs your appliances is generated and sent to your home within a second of it being requested. These operation centers are vital to the traditional energy systems we have in place now. How do grid operation centers affect energy use? Grid operators have limited control over the power they manage. Although operators do have control over the flow of energy, they are limited in the data needed to make better decisions. For example, the primary goal of a grid operator is to ensure the energy being requested is being used. If the energy is not used, a “slosh” effect can occur — similar to water being poured into a bathtub. If the slosh is severe enough, it can result in the operator instigating rolling blackouts, or the power network could simply blackout to prevent more serious energy issues. Why are energy grid operation centers important? As mentioned above, grid operation centers manage the flow and use of energy from the grid to the consumers. This position is extremely important. Smart grid technology is more complex than flicking on a light switch, pressing a button, or tapping your phone’s screen. The combination of limited energy data and a reactive strategy to ensure power efficiency, effectiveness, and reliability is a dangerous approach to energy management. How can a smart grid help energy operations? A smart grid offers an advanced, new approach to energy management and transmission. It provides more data, a two-way communication between grid and consumer, and it provides a more effective solution to energy supply and demand. A new technology utilized in smart grids called Phasor Measurement Units (PMU) samples current and voltage multiple times per second instead of once every two-to-four seconds like our traditional energy systems. This allows for a real-time snapshot of how energy is functioning with the ability to reduce the time between energy management decisions. A smart grid allows for dynamic monitoring of an entire power system, which offers more opportunities to increase energy efficiency, effectiveness, and reliability from the grid to the consumer. The decrease in time between voltage and current sampling could have prevented the 2003 blackout that affected more than 45 million people across eight U.S. states. When power demand is high and a power system fails, energy oscillation occurs, which can cause rolling blackouts. The energy demand spreads to the other pathways, which increases the power load to systems that cannot potentially handle it. The result is a single system in Ohio failing, and the oscillations spread across eight U.S. states and into Canada in a matter of hours. A blind spot for a large majority of grid operators across the nation with our traditional energy systems is the inability to see the “big picture.” Grid operators are able to manage and review their systems, but it’s tough to understand the grid operations around them that would be directly affected by their grid failing in some way or vice versa. A smart grid would offer the opportunity for grid operators to not only see more data about their systems, but also the opportunity to study data from across the nation, including the systems that have a reciprocal relationship with them in the event of a system failure. When it comes to the sharing economy, energy operations benefit immensely when more data is collected and shared between grid operators, consumers, and utility companies. Keep solar simple with West Coast Solar! Now that you’re aware of how grid operation centers, grid operators, and energy flow functions to keep your lights on, consider how you can benefit from a smart grid, renewable energy production, and more efficient energy consumption. Want to take a small step and help your pocketbook, the environment, and the future of your loved ones? Give us a call today, and let’s discuss installing solar panels on your home or business! 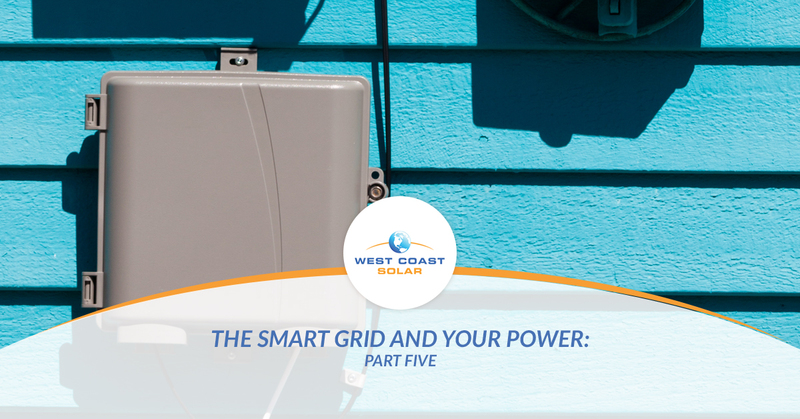 Otherwise, continue reading this blog series with part six to learn more about smart grids and distribution intelligence.